One of our clients is a 34-year-old man born with cerebral palsy and epilepsy. After his mother passed away, his long-term caregiver and her husband assumed full responsibility for him. He requires assistance with all daily living skills: feeding, bathing, dressing, transferring and toileting. Over the years, the physical demands of caring for him have taken a toll. Lifting and bathing him, for instance, is a two-person task that waits until the caregiver's husband comes home from work. 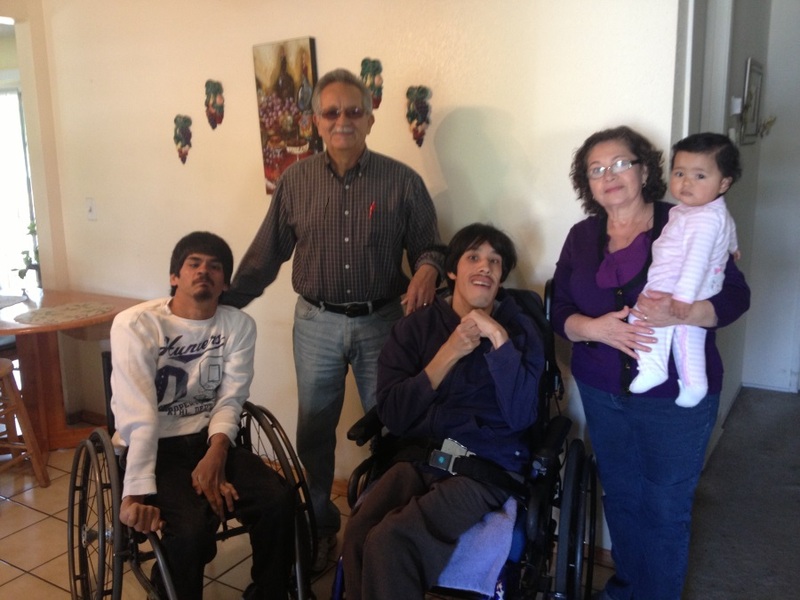 Our goal is to give this family hope by improving the safety and comfort of their home. The students plan to install a bed lift; make the bathroom, doorways and backyard wheelchair accessible; install hardwood floors; and provide other renovations that would otherwise go undone allowing them to manage his daily needs with less overall stress. Donna is 53 and used to work as a Registered Nurse. We have lived in Nipomo in the same house for 23 years. Donna was injured January 2013. She had stomach problems, went to bed sick and fell out of bed. When I found her, her head was against a box on the floor. The neurosurgeon said it was the perfect story . The angle her head was, the time she laid there, and the genetically small passage in her spine for the main blood vessel. They all added up to what was essentially a stroke to the spine, with the blood shut off, her nerves died. Now she has no feeling from the chest down and cannot walk and can barely use her arms. She spent half of 2013 in rehab hospitals near San Jose, 5 months on a ventilator. She stayed strong and was weaned off the ventilator, but because of her impaired diaphragm function she is always at risk from respiratory problems, even a simple cold. In the hospitals she was unable to rehab as she could not sit up in her wheel chair long enough due to a sore on her tailbone that progressed to a hole big enough to stick a golf ball in with infection down in the bone. They wanted to discharge her to a nursing facility but instead our son and I brought her home in June. He was a big help as he was an army combat medic over in the war in Iraq. She stayed in bed to heal and Thanksgiving weekend we had surgery to close her wound. Two more months of lying flat for the surgery to heal. In January, she spent a month in Santa Barbara Rehab Hospital so she could get use to sitting up again in her wheelchair. We learned a lot about spinal cord injuries quickly. How a simple ingrown toenail can drive her blood pressure so high that without intervention she can stroke out, as the brain can't send signals down the spine to lower her blood pressure anymore when an injury or other irritant , like a full bladder or bowel occurs. Her body now has poor temperature control, and a hot day or room can trigger the same results. She also has continuous nerve pain in her arms and neck, that she describes as on fire with pins & needles thrown in with her hands stuck in an ice bucket. I tell you all of this, so you can understand how a simple thing turned our lives upside down and how much she has endured, and the level of despair she deals with daily. She is completely dependent on others for all her needs, and we are now working on transitioning from her life in bed to life on wheels. Hence our need for a bathroom remodel. We want to express our gratitude for the help your team from Cal Poly has offered to us. It is not just the physical remodel that is important to us. which will make our life easier, but it is knowing that people we never met, care enough to help us and others in similar situations out. Lately, when people visit, I say, "Donna, tell them the good news." And she gets a big smile and says, "The students from PolyHouse are coming to build me a new bathroom." You all have given her something she hasn't had in awhile...Hope. 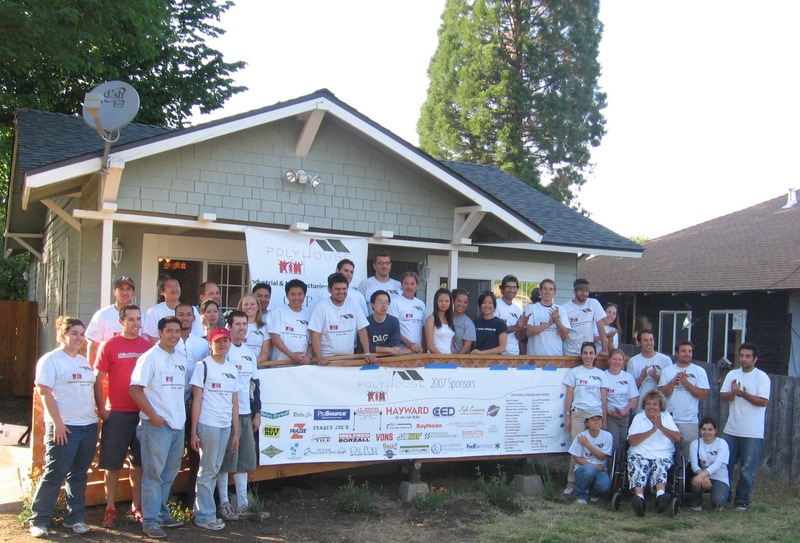 This year, we hope to help three families in the San Luis Obispo Community. One of the families has a son in his 30's that is quadriplegic. His parents must transport him everywhere around the house and, as they age, it becomes increasingly difficult to care for their son. They will eventually want to convert their residence into an assisted living home to support others and be able to continue living with their son. 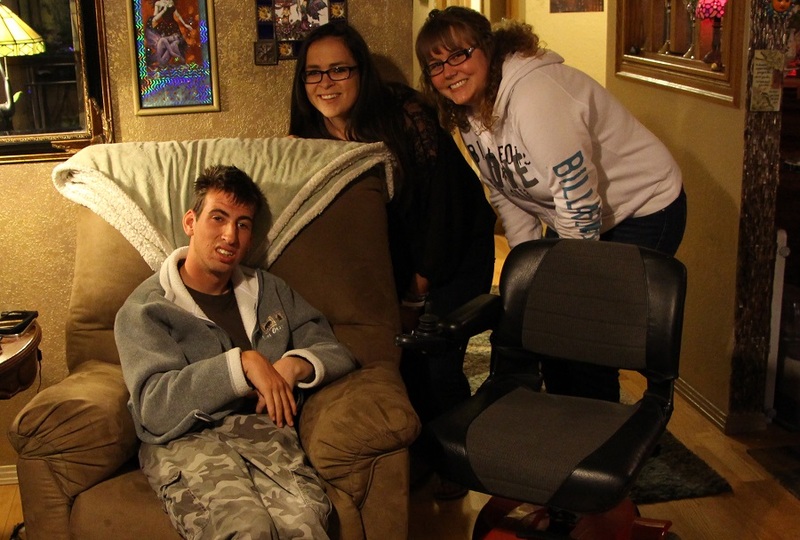 The second family is a 20 year-old man, who has minimal use of his legs and left arm, and his mother. Now that the son is older, the mother is having a hard time taking care of him on her own. This team's goal is to add a track (and facilitate necessary renovations) that will allow him to have easier access to the restroom, living room, and kitchen without his mother's help. 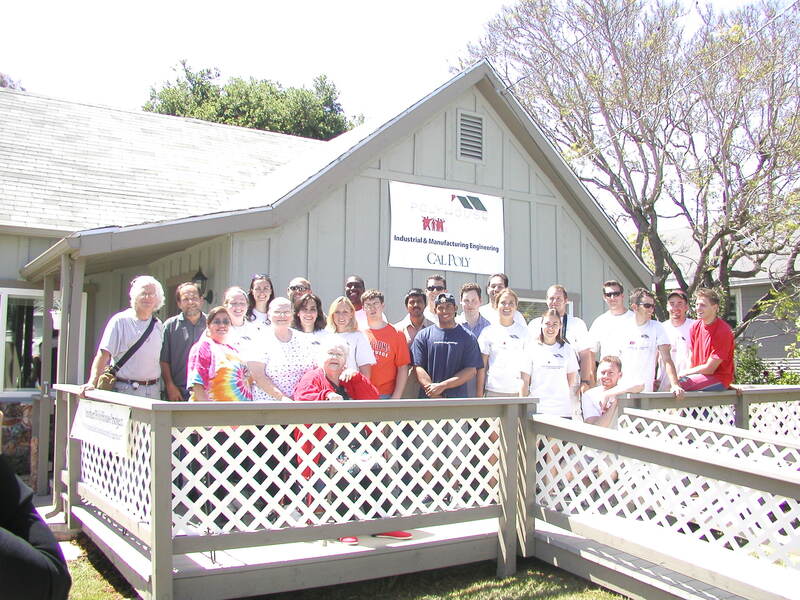 The third team of students is working with a family in Paso Robles that has two disabled sons. Once son is able to move around the house in his motorized wheelchair while the other son has no muscle function and relies on other people pushing him around in his wheelchair. This team plans to install a lift to transport one sone from his bed into his wheelchair and possibly around the house. In addition, they will attempt to make the house more wheelchair friendly by widening halls and doorways and installing hardwood floors. Our objective is to facilitate the successful alignment of code restrictions and enforcement between the county and Sunny Acres and build collaborative partnerships for the program's long-term success. We also want to lay the foundation ' literally! ' for an 8,000-square-foot residence that will provide safe housing for the homeless. Dr. Roya Javadpour was on Sabbatical Leave as a Visiting Professor at Nottingham University Business School during the 2009-2010 academic year. 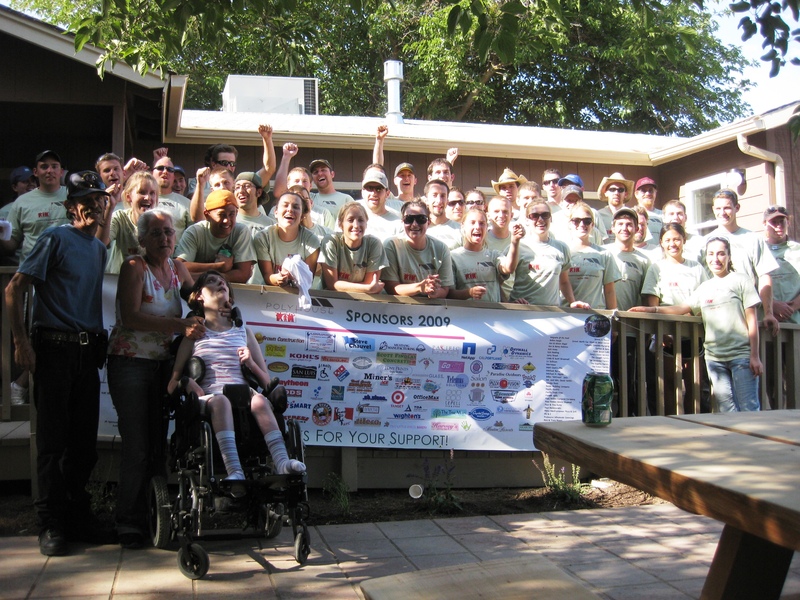 In her absence Dr. Liz Schlemer coordinated the efforts for the 2010 PolyHouse project. Our 2009 client was a 16 year old disabled young woman confined to a wheelchair and her aging grandparents who have adopted her and have also cared for over 20 foster children. The granddaughter was born with a heart defect and had 3 heart surgeries before the age of 3. She developed seizures and experienced a stroke at 13 months. Complications arose in her last heart surgery which left her in a coma for 12 days, and when she woke up she had permanent severe and profound multiple disabilities which left her dependent for all self-help needs. Her grandparents make every possible accommodation for their granddaughter within their power, yet as she has grown over the years the physical demands of caring for a dependent young woman has taken a toll. 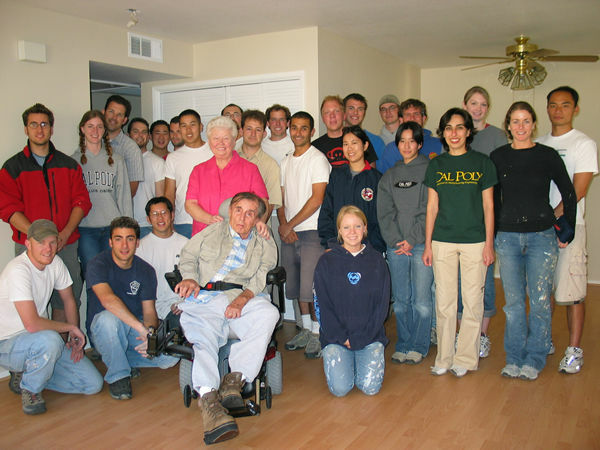 It was our goal to improve the safety and comfort of their home with the possibility for completion of a roll-in shower, a heating system and other much needed renovations that would otherwise go undone bringing great hope for them. Our 2008 clients were a delightful couple both in their late forties, that had been dealing with the challenges of disability for many years and whose circumstances prevented them from making many necessary changes in their home. After a year of treatment for a pinched nerve, the husband was referred to a neurologist in 1992, who began treating him for his disorder that resembled multiple sclerosis in its symptoms and presentation. Within 3 years he was confined to a wheelchair. He now has minimal use of his hands and legs and is unable to transfer, feed himself or handle any of his personal needs without assistance. His wife is his primary caregiver. Their home was in need of several modifications and improvements to make it more accessible, safe and liveable for him, and to decrease caregiver demands. It was our goal to improve his ability to maneuver safely within his home and with the possibility for completion of a roll-in shower and other much needed renovations that would otherwise go undone, bring great comfort and hope for them. Our 2007 client was a delightful lady in her late sixties who had been dealing with the challenges of disabilities for many years. In 1972 she was diagnosed with Type II Adult onset Diabetes. This was a life change in itself; however her health again was changed due to a stroke she endured in 1988 leaving parts of her body paralysed. Her diabetes continually progressed, which became uncontrollable at times leaving her health fragile and her immune system low. In 1998 as a result of her diabetes's progression her left leg was amputated, leaving her with severe arthritis in her right leg. As her health stayed somewhat stable for the next few years, her injuries did not. She injured her second toe on her right foot and when it would not heal; it too needed to be amputated. This had left her with the continued challenges of disabilities and diabetes including the daunting tasks involved in keeping her home maintained. It was our goal to improve her ability to maneuver safely within her home and with the possibility for completion of a roll-in shower and other household projects that would otherwise go undone, bring great comfort and hope for her. Our 2006 clients were a delightful mother and daughter whose circumstances prevent them from making many necessary changes to their home. The daughter was 54 years old and had both physical disabilities and chronic depression, stemming from a work related accident some years ago. She had had back surgeries and severe nerve damage in her legs which had left her in constant pain. The daughter is the primary caregiver of her 75 year old mother and also has a mentally and physically handicapped child. Due to her depression, physical disabilities, and overwhelming caregiver stress, she did not have the energy nor the means to maintain their shared home. Her motherâ€™s health has continued to become more fragile as a consequence of her diabetes, blindness, and other age related illnesses, creating more dependency on an already frail daughter. It was our goal to improve the safety and comfort of their home and with the possibility for completion of household projects that would otherwise go undone, bring great comfort and hope for them. 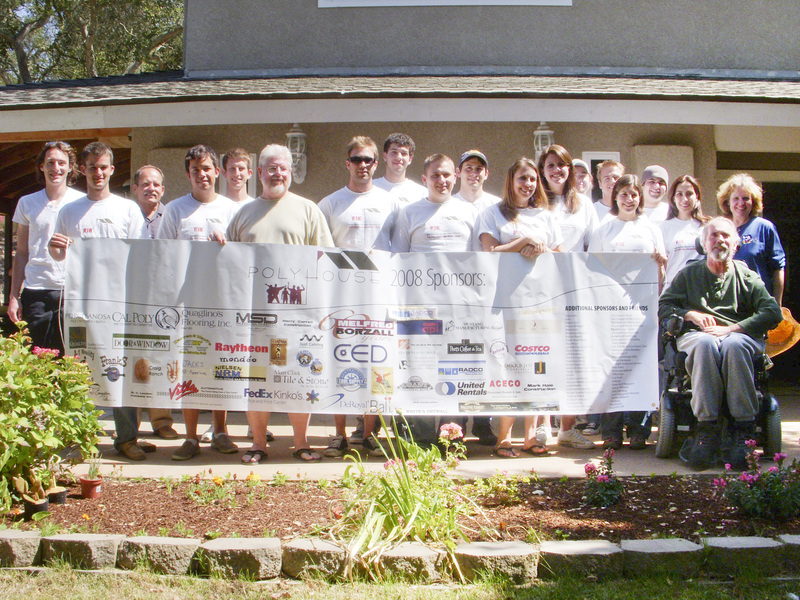 Our 2005 client was a gentleman, whose circumstances prevent him from making many necessary changes to his home. While riding his bicycle a few years ago, he was hit from behind and suffered major injuries. He was flown by helicopter to Stanford Medical Center where they discovered that part of his spinal column had been crushed. Through several surgeries, they inserted four titanium rods and fused his spinal column and removed a rib to repair the spinal column. His hip was shattered and the bone extending from hip to knee had to be cut off and the hip rebuilt requiring hardware to be inserted. Prior to the accident he was very healthy riding his bicycle 200 miles a week and working as a musician. The accident left him in constant pain, unable to walk more than a few blocks and has difficulty lifting, bending or kneeling. It was our goal to improve the safety and comfort of his home and with the possibility for completion of household projects that would otherwise go undone, bring great comfort and hope for him. Our 2004 clients were a delightful couple both in their late sixties, that had been dealing with the challenges of disability for many years. As the victim of a violent crime in 1980, the husband suffered a traumatic head injury, forcing early retirement. In 1997 a failed knee replacement and severe infection forced his physician to fuse his right leg. A fall after coming home from the hospital required a subsequent hip replacement. He is now wheelchair bound and cannot be left alone. His wife is his primary caregiver and because their funds are limited she can afford only a few precious hours a week of outside care. Due to his disability his care requirements are very heavy and physically draining for his wife. It was our goal to improve the safety and comfort of their home and with the possibility for completion of a roll-in shower and other household projects that would otherwise go undone, bring great comfort and hope for both of them.